Earlier we covered a news about the Fleksy + GIF Keyboard for iOS devices, whi was Free for a limited time Fleksy + GiF Keyboard for iOS–Free for a limited time. Now on iOS it will cost you $ 0.99. Flesky now announced the keyboard for the Android devices too. This time also it will be free for a limited time, so get the keyboard now. The play store description says it will be free for a week only. The difference with the Flesky keyboard and Fleksy + GIF Keyboard is that you can search for gifs and can send to your friends easily from the keyboard itself from the later. Gestures like swipe right for space, swipe left for deleting a word etc. Multi-language support – it supports 42 languages. You can get the keyboard from the playStore. After installation just signup from the application. Fleksy's paid version (which you will be getting for free now) includes optional in-app purchases for premium content. 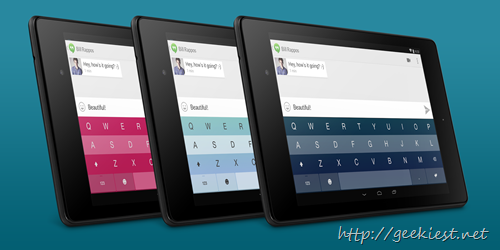 Get Fleksy + GIF Keyboard Free for a limited time for your android devices. Get Fleksy + GiF Keyboard for iOS for Free for a limited time.